The ciliary body is a ring of tissue that encircles the lens. The ciliary body contains smooth muscle fibers called ciliary muscles that help to control the shape of the lens. Towards the posterior surface of the lens there are ciliary processes which contain capillaries. 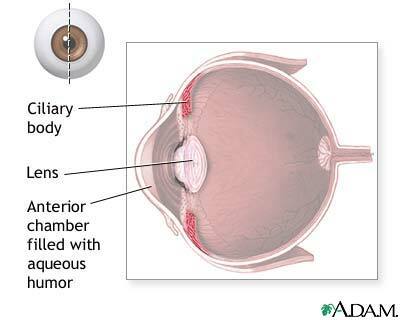 The capillaries secrete the fluid (aqueous humor) into the anterior segment of the eyeball.